Juniper Networks is introducing a series of new applications called Juniper Bots that are intended to simplify network operations by translating intent into automated workflows. Contrail PeerBot automates the traditionally cumbersome process of network peering -- managing multiple Border Gateway Protocol (BGP) routing and complex policy enforcement -- to simplify policy enforcement and on-demand scaling. Contrail TestBot, an application that's part of Juniper's broad effort to help network operators embrace a DevOps approach for Continuous Integration/Continuous Deployment, automates the continuous auditing of design, provisioning, and deployment changes in the network. AppFormix HealthBot is a machine learning fitness and health tracker for the network that leverages AppFormix to collect real-time network data and glean insight, HealthBot translates troubleshooting, maintenance, and real-time analytics into an intuitive user experience to give network operators actionable insights into the health of the overall network. Also being introduced are Juniper Extension Toolkit (JET) enhancements that extend the current management and control API framework to the data plane. This will allow developers to create applications with direct data plane access on Juniper's vMX and MX Series 3D Universal Edge Routers. 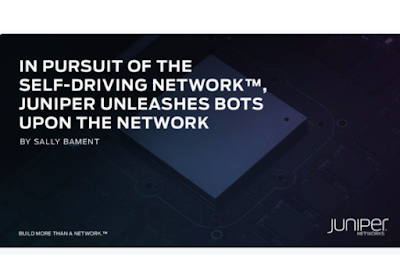 "Juniper Bots bring us closer to our vision for The Self-Driving Network, one that requires less human intervention and the ability to focus on more strategic business initiatives. To move at the speed of business, network operators need to spend less time precisely managing manual network knobs and levers, and more time expressing intent," stated Sally Bament, vice president, service provider marketing, Juniper Networks. Cisco will acquire Cmpute.io, a start-up based in Bangalore that optimizes applications by moving workloads between private and multiple public clouds or region, based on current performance metrics and/or spot pricing. Financial terms were not disclosed. Cmpute.io’s team and technology will join Cisco CloudCenter.